Capacity: 1000 Nos. / Hr. We are regarded as the leading brand affianced in offering highly efficient Dough Ball Making Machine. Machine provided by us is commonly demanded in food processing industry and is suitable for making dough balls in bulk. 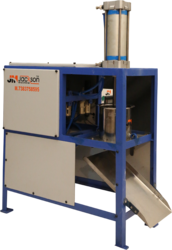 This machine is carefully manufactured with the use of well tested components and cutting edge technology. Pneumatic Ball cutter produces dough ball of various sizes . this machine can cut dough ball for puri, chapati, peda etc, Weight and size adjustable. Introduction -Our company is a well-known name of the industry that specializes in mechanized and supplying a premium quality range of Dough Ball Maker. Automatic Dough Ball Making Machine, Capacity: 2500 Nos/Hr. Catering to the requirements of our clients, we are involved in offering Dough Ball Peda Making Machine. - Power Load : 0.85 KW /Hr. - Dimensions : 3.4 ft X 3.45 ft X 4.35 ft.